John Jordan, second son of William Jordan and Blanche Fullerton, was probably born around 1802 in Kanawha County, (West) Virginia, although his tombstone gives his date of birth as December 6, 1798. John was in the family group that moved during the autumn of 1827 from Virginia to Tippecanoe County, Indiana. However, not long after settling in Tippecanoe County, John moved north into Jasper County, where he and his widowed father made their home at the time of the 1840 census. John was the last of the Jordan siblings to marry, crossing over to Iroquois County, Illinois, to married Sarah Thomas around 1841, then returing to his farm in Jasper County. Sarah was born circa 1808 in Ohio and died February 12, 1853, in Indiana. John died on February 10, 1865 probably in Jasper County. Both he and Sarah are buried in the Welsh (Egypt) Cemetery in Jordan Township, Jasper County, Indiana. John was one of the first settlers in Jordan township, which is said to have been named for him. John is found in the censuses of 1840-JasperIN, 1850-JasperIN, and 1860-JasperIN. He is possibly also in 1820-CabellVA and 1830-TippecanoeIN in the household of William Jordan/Jourden. 1. Joseph Thomas Jordan was born circa 1841 in Jasper County, Indiana, and died in Texas circa 1899. He married Katherine Annabell “Kate” Lynch on October 9, 1867 in Jasper County, Indiana. Sometime in the late 1860s, Joseph, his brothers James and William, and their sister Josephine moved to Independence County, Arkansas, where the extended family lived for a while before splitting up. Joseph, William and their families moved on to the Parker County/Tarrant County area of Texas in the 1870s, where they lived for the remainder of their lives. 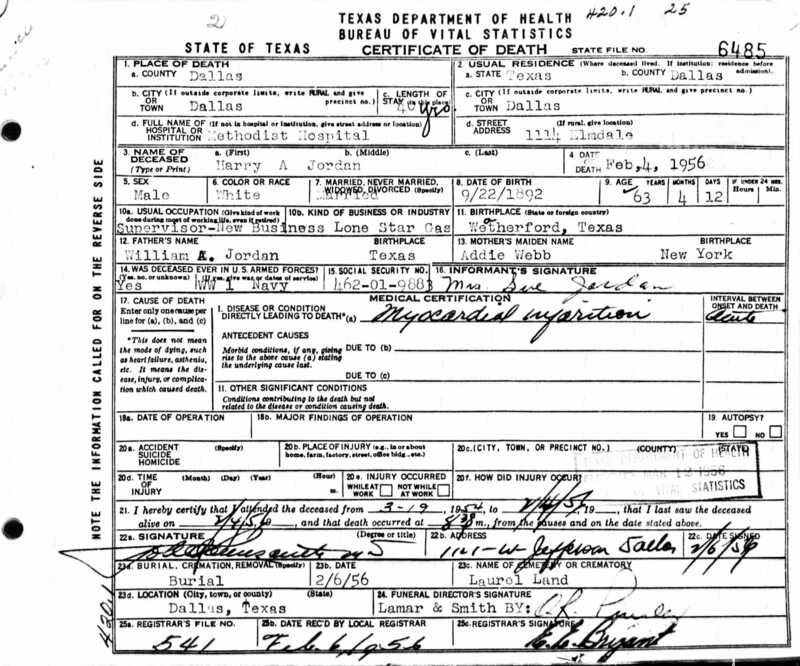 Joseph’s wife Kate, who was born on January 8, 1848 in Indiana, survived Joseph by nearly 35 years, dying in Parker County on June 22, 1933. Joseph’s burial location is unknown, but Kate is buried in Springtown Cemetery, Parker County, Texas. 2. 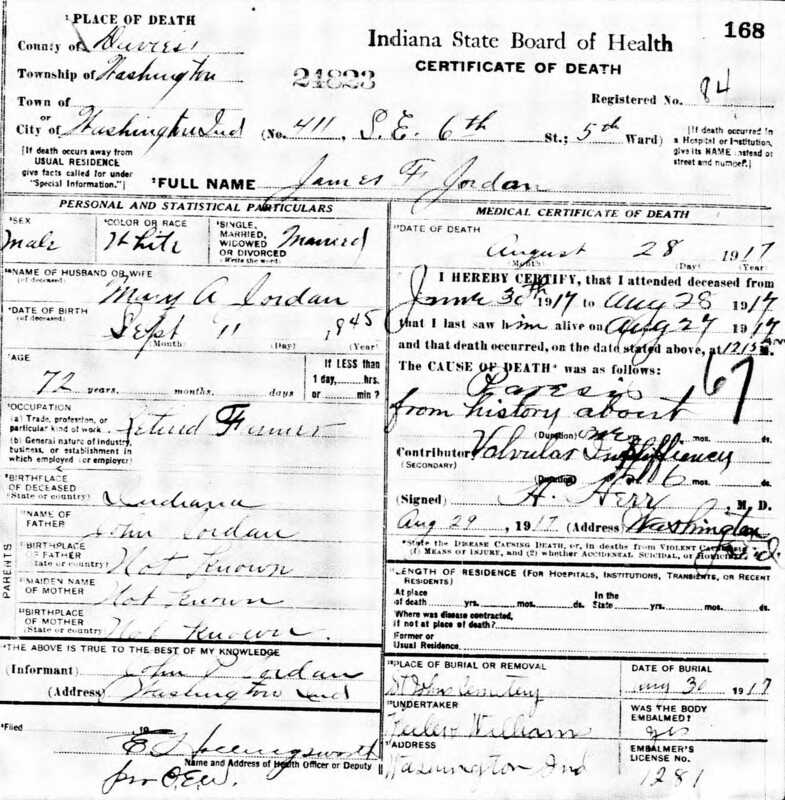 James F. Jordan was probably born around 1844 in Jasper County, Indiana (also said to have been born on September 12, 1845 and in June 1847). While still a teenager, he married a local girl, Nancy Lilves (born February 11, 1841 in Indiana), a daughter of John C. Luelfes, who died, possibly in childbirth on August 13, 1865, leaving James two infant daughters to care for. Nancy and one daughter are buried in Egypt/Welsh Cemetery, Jasper County, Indiana. A few months after Nancy‘s death, James married her younger sister, Adeline Lilves. Adeline had been born in Indiana in August, 1847; she and James were wed on January 11, 1866, in Jasper County. In 1867, James quit the Jasper County farm his father had owned and moved with Adeline and other family members to Batesville, Independence County, Arkansas, where the Jordan brothers started a livery business. In 1871 following the failure of that business, James joined the Johnson and Romela Circus as their boss canvas man. It was probably around this time that he and Adeline divorced and she returned to Jasper County, Indiana. Adeline later married Samuel Black; they had a daughter, Myrtle, and moved to Colorado. Adeline died probably in Jefferson County, Colorado in April 1922 and is buried in Riverside Cemetery, Denver, Colorado. James was out of work again during the winter of 1873-1874 when the circus folded in Washington, Indiana. It was there on January 15, 1874 that he married his third wife, Mary Buckley (born November 10, 1841 in Washington, Indiana), daughter of Patrick Buckley and Mary Cody. James briefly worked in livery until he rejoined the entertainment industry, taking employment at various times with the Sells Brothers Circus, the Adam Forepaugh Show, and the B.E. Wallace Show. James died a wealthy and respected member of his community on August 28, 1917 in Washington, Daviess County, Indiana, owning five city residences and 40 acres of land. Mary survived her husband by eight years, passing away on September 26, 1925 in Washington, Indiana. James and Mary were well-respected members of St. Simon’s Catholic Church in Washington, Indiana, and both are buried in St. John’s Cemetery, Washington, Daviess County, Indiana. 3. William Henry “Doc” Jordan was born on March 8, 1845 in Jasper County, Indiana. He died September 7, 1918 when he was struck by a train in Arlington, Texas. 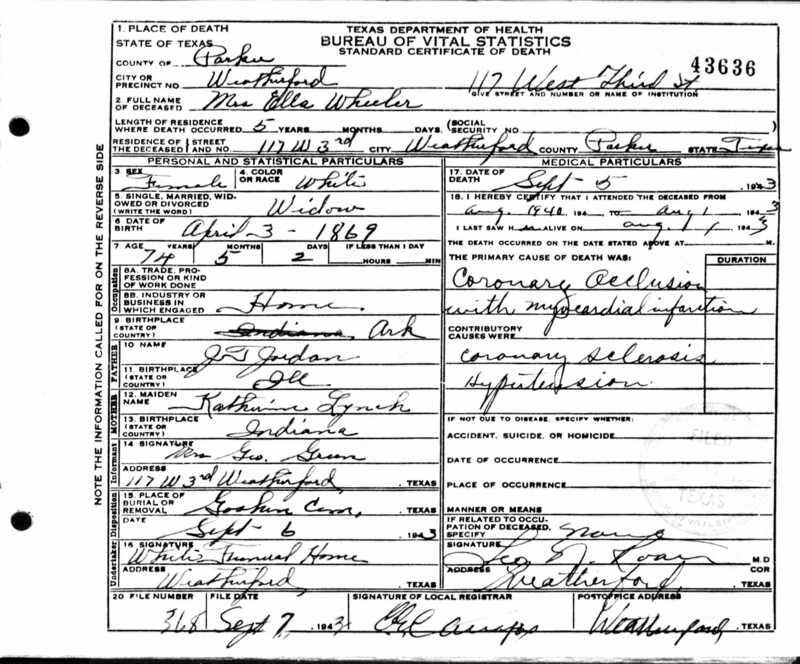 He married Adeline “Addie” M. Webb in 1879 in Tarrant County, Texas. Adeline was born in New York on October 17, 1854 and died on February 21, 1939 in Arlington, Texas. Both William and Adeline are buried in Arlington Cemetery, Tarrant County, Texas. 4. John B. Jordan was born circa 1846 in Indiana and died on September 7, 1867 in Jasper County, Indiana. 5. Samuel M. Jordan was born circa 1848 in Indiana. 6. Josephine Jordan was born circa 1853 in Indiana and died between 1870 and 1898. 1 Proof that John Jordan is the son of William and Blanche is found in several land documents where the heirs of William Jordan are selling off their inherited land, including Tippecanoe County Land Record Books “W” (pp51-53) and “29” (pp612-615) both dated February 1847 and Book “29” (p108) dated April 1850. 2 The Date of John’s birth on his tombstone is December 6, 1798, but that doesn’t agree with tax and census records, which puts his birth around 1802. Dates of John’s death and Sarah’s birth and death are taken from their tombstones. If John’s birth was in 1798, he could have been born in Greenbrier County; otherwise, he was born in Kanawha County. A biography of John’s son (James) published in 1898 (History of the Catholic Church in Indiana) notes that John was born in 1802 in Greenbrier County. Location of John’s marriage to Sarah Thomas is taken from the biography of son James. Iroquois County, Illinois, marriage records of that date were destroyed in a fire, so there is no extent documentation of their marriage. 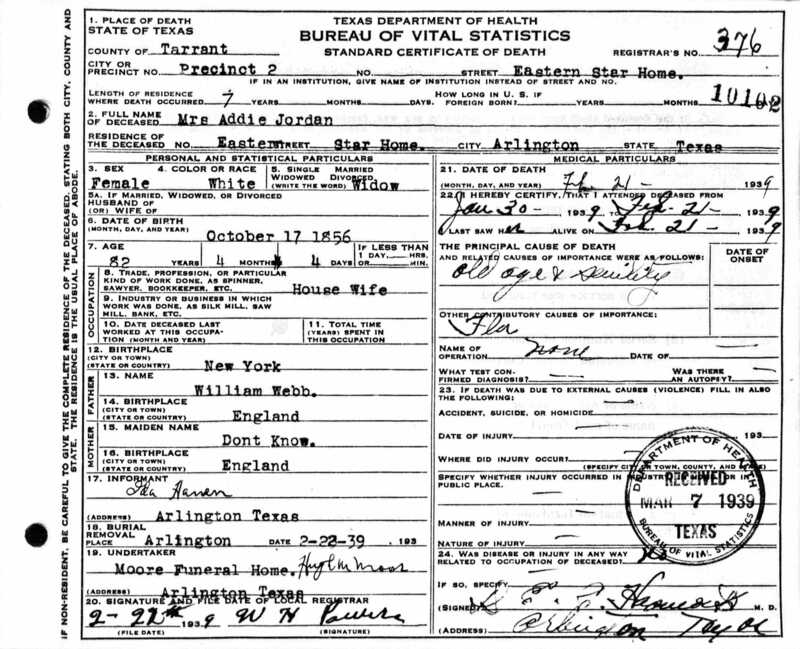 3 Information on John’s children comes from census records; Aunt Mollie’s Diary; the aforementioned biography of James F. Jordan, Indiana marriage and death records, tombstones, Texas marriage records, the obituary of William H. Jordan, Indiana Death Certificates, Texas Death Certificates. Note that the dates on Addie M. Jordan‘s tombstone (10/17/1854-3/8/1939) differ from those on her death certificate and in her obituary (10/17/1856-2/21/1939).